In a world where the daily news is filled with negative events and bullying can seem all too common, it has never been more important to teach kids the value of kindness and the powerful effects it can have on others. Kindness can take many forms — a thoughtful gesture, a compliment, an offer of help, even something as simple as a smile. Your library can be the place to let kids discover the impact even the smallest kind deed can have on another person’s life. Encourage students to spread kindness wherever they go with these eight simple activities. Divide kids into small groups. Give each group a piece of poster board along with markers and other art supplies to design a kindness-themed poster. Before they begin, have them brainstorm a list of kindness slogans or look up quotes about kindness. Examples include, “Being kind never goes out of style!” or “Kindness Changes Lives.” They can then choose their favorite slogan or quote and design their poster around it. Hang the posters around the school or library. 2. Who Do We Appreciate? Ask students to think about all the people who work in their school or library. What do they appreciate about these people? Have students write letters of appreciation to these workers, thanking them for all they do and the difference they make in the school or library. Students might write to the custodians, cafeteria workers, people who shelve books, etc. Hand-deliver the letters. This activity can also be extended to include family members and friends — what do students appreciate about the important people in their lives? Use Upstart’s Kindness Cards to spread goodwill throughout your library! Place the cards in books for students to find when they check them out. They can then write their own positive message on the space on the back of each card and either trade cards with other students or place them back in books for others to find. Set up a Kindness Zone in the library. 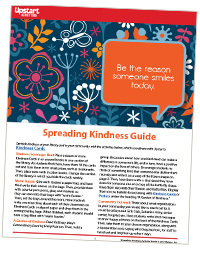 Create a bulletin board with the heading “Kindness Counts!” Post some of Upstart’s Kindness Cards around the board. Then, place a decorated box near the bulletin board. Write a variety of random acts of kindness on slips of paper and put them in the box (ideas include holding the door for someone, saying hello to a student you don’t know, letting someone go in front of you in line, etc.). Have kids draw one slip from the box each week and then sign it and turn it in when it is completed. Post the completed kind acts on the bulletin board. When all of the kind acts have been posted, reward the class with a special treat. Have each student write his or her name at the top of a blank piece of paper. Then, tape each student’s piece of paper to their back. Have students walk around the room and write one positive thing about each person on their piece of paper. At the end, have students partner up and read each other’s papers out loud to each other. They will love hearing all of the nice things others have said about them! Animals also need kindness. As a group, talk about the many ways we can practice kindness for animals. What are some things you can do in the library to help out our furry (or feathered) friends? Hold a craft day to make toys for dogs and cats. Take the finished toys to a local animal shelter (be sure to call before beginning the project to ensure they accept such donations). You can collect spare change in a jar at the circulation desk, and at the end of a set time period, take the change to a bank, then donate the money to a local pet shelter or animal rescue group. And don’t forget about the birds: make bird feeders and hang them where they are visible from the library windows so that students can see how their hard work is helping the birds. Ask students to notice any negative self-talk they might do that makes them feel not so good about themselves. Give them sticky notes and markers, and have them write a positive affirmation to combat each negative thought. For example, “I’m not smart enough” can become “I am always learning new things!” Then, instruct them to post the sticky notes in places where they are likely to see them every day, such as the bathroom mirror — and whenever the negative thought creeps in, replace it with the positive one! 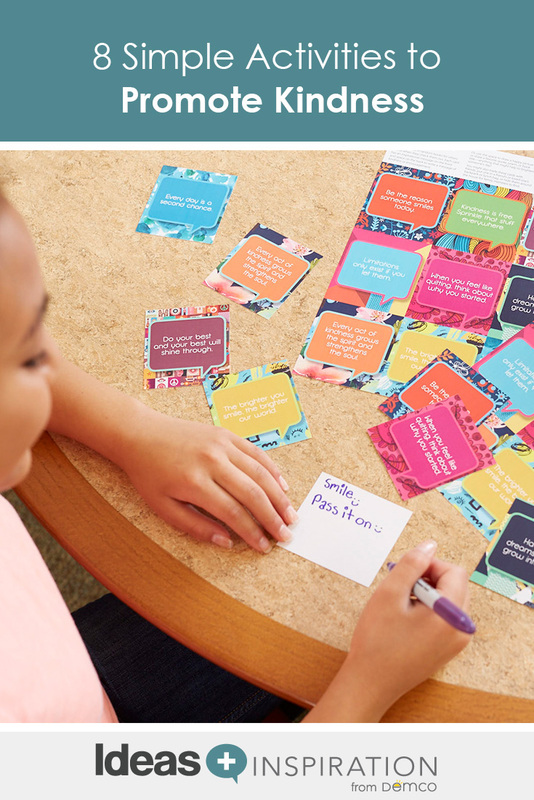 For more kindness activities, check out Upstart’s Spreading Kindness Activity Guide and Be Buddies, Not Bullies Pinterest board, and read Gina Seymour’s How to Inspire Students to Be Compassionate Makers blog post. How wonderful that you’re having a kindness assembly! So happy to hear this was helpful for you. Love the Kindness Cards and Spreading the Love activities! I teach English as a second language for Brazilian kids and for this Valentine’s Day season we’re having a project about kindness… These activities will sure come in handy! Thanks!